Kool-Aid is a staple of childhood – or it was when I was growing up. But did you know that Kool-Aid has other surprising uses? In the bathroom of all places! No one likes to scrub the toilet, but it is a job that needs to be to be done. 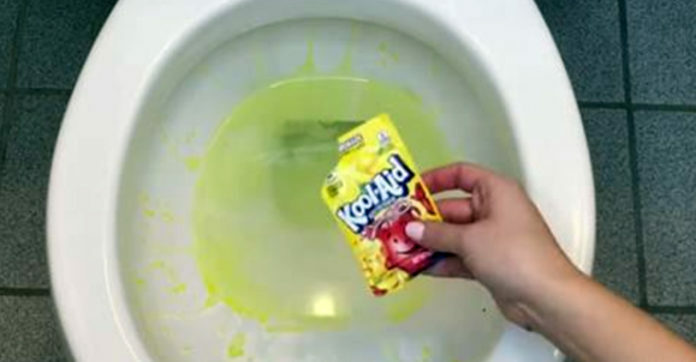 We are about to introduce an amazing trick to clean out the toilet, and all you need is some Kool-Aid! Use vinegar and water first to remove any build up under the rim, if you use paper towels you can just flush them. For those hard water stains, sprinkle Kool-Aid right out of the package into the toilet – let it sit for an hour, brush and then flush! TaDa! Sparkling clean! To keep that toilet brush clean, pour some Pine Sol into the brush holder, the cleaner will take care of the nasty bacteria in between uses! Share away, people!